Susan made a career of counseling others, and eventually published a book: Helping Her Get Free; A Guide for the Families and Friends of Abused Women. Susan says she’s grateful for the experience now, because it taught her about the power of fear. She made a career of counseling others, as a psychotherapist to battered women, and eventually published a book: Helping Her Get Free; A Guide for the Families and Friends of Abused Women. Susan, how did your love of bicycling begin? I grew up in Austin, TX when it was still a middle-sized college town, at a time when my friends and I could ride our bicycles all over, on the street with no helmets, without meeting an unfriendly motorist. We were free to explore with every ride having adventure potential. No adults and no phones were around to call for help when my friend sliced the end of her toe almost clean off after a nasty fall from her bike going full tilt down a hill. We figured it out and she survived. Wow! Did you continue to ride bikes into adulthood? No, my friends and I gave up bicycling the day we got our drivers’ licenses. Cars replaced our bikes to allow our continued independence. Car culture was so ingrained that we began to identify classmates by what they drove: “There goes Nova guy” or “Red VW Bug girl”. I was the “Bomb” after my Dad’s old Lincoln. What inspired you to start cycling again? I didn’t even consider riding a bike again until I was 52 years old! My husband and I had lost weight and regained our health through a dietary change. We were looking for an outlet for our newfound energy when I happened upon a beautiful sky-blue Electra Townie bike. Back then, I thought I was doing great riding it one mile to the grocery store. Ever so gradually, bicycles seeped into our lives. Now, eight years and many bicycles later, they’ve become our primary form of transportation here in New Mexico. We still own one car but use it as little as possible. It gives me great satisfaction that our bicycles fill up one side of our garage where a car used to be. "I didn’t even consider riding a bike again until I was 52 years old!" What kind of cycling do you do these days? I don’t care about how far or fast I ride, just getting where I need to go and back. 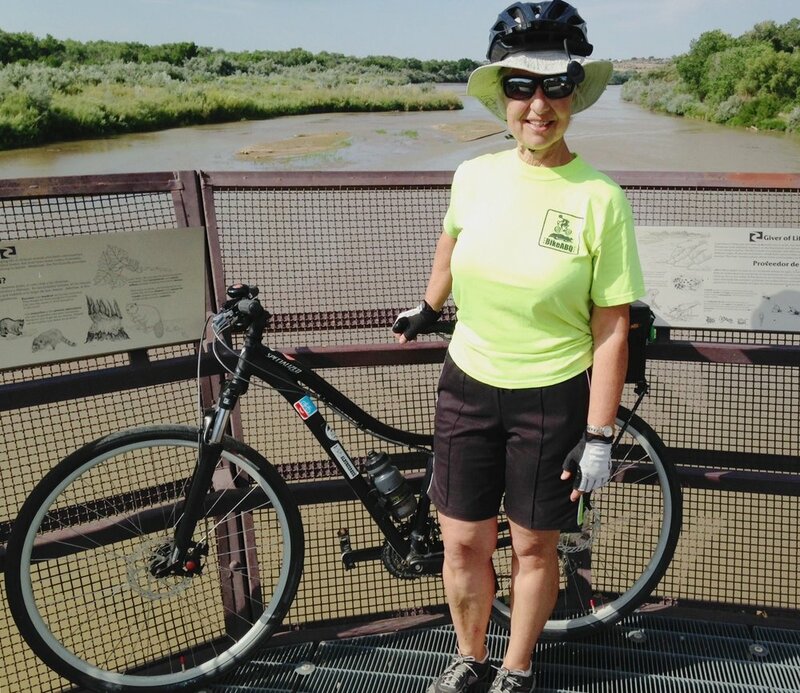 Much of my riding during the week is on pavement, running errands around town, but there are some great mountain and Rio Grande Valley dirt riding nearby for longer distance day trips, usually with my husband. We live on a mesa so I’m “forced” to climb hills most anywhere I go. How does bicycling enrich your life? As one who came of age during the mind-altering 70’s diet and 80’s aerobics obsessions, bicycling has provided me the perfect antithesis to those. Instead of the monotony and singular focus of gym workouts, on a bike I can get out of my own head. My mind naturally gravitates away from my appearance and toward the beauty of nature, the environment I’m helping to save and the satisfaction of arriving at my destination under my own power. You mentioned “adventure” as one of the things you loved about riding a bike as a kid. Does adventure play a role in your cycling today? Yes, my daily travels often provide me with the same type of adventures that I had as a kid. Being a retired Psychotherapist and “empty nester”, life can feel unstructured and narrow. 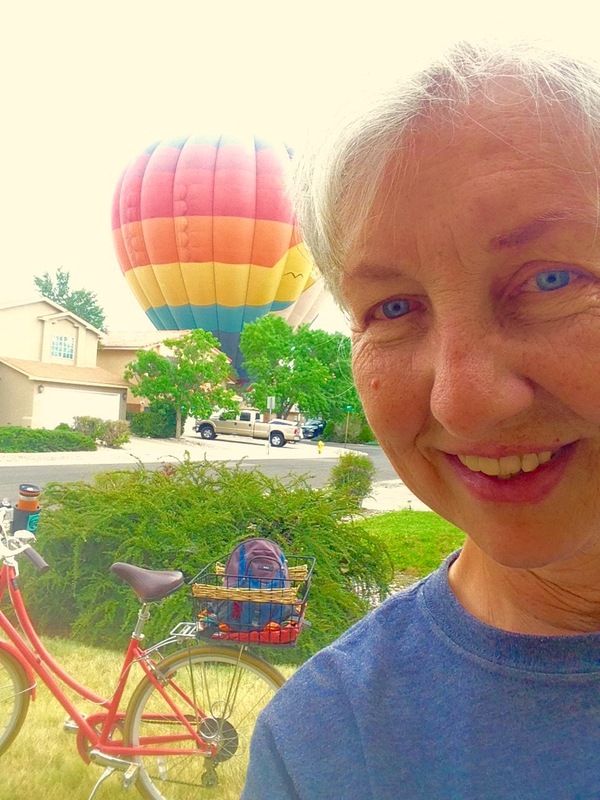 Bicycling helps me discover places in Albuquerque I never knew existed when I drove a car. That makes me feel younger and daring. My favorite part, though, is meeting new people. They just come up to me and start talking. I love that. "My favorite part is meeting new people. They just come up to me and start talking. I love that." If you’re comfortable, would you share your story about overcoming fear? I have a history with fear. In my early 20s I was physically abused by a boyfriend who stalked and threatened me for a year after he beat me up. He was someone I thought I could trust, but he became the most dangerous to me. That experience changed the course of my life, and I’m grateful for that. I made a career counseling battered women and their families and later wrote my book, Helping Her Get Free; A Guide for the Families and Friends of Abused Women. So, about fear, I’ve learned a few things. Some fears are appropriate, protective and realistic and some are less so, hindering emotional development. The hard part is determining where the fear is on that long spectrum. Does fear ever appear in your daily life now? When I’m out on my bike, middle-aged folks approach me with their fears, many wishing they had the guts to ride a bike again. Some, who think nothing of driving at 80 mph and dodging distracted drivers, think I’m crazy. I try to help them tease apart the realistic fears vs. those which have no basis in fact/statistics. I tell them that now, I feel safer on my bike than in a car. I get off the road if I feel in danger. I can’t do that in a car. I hop on a bus if a new road seems too dangerous. I listen to my body and instincts and do what I need to do in the moment to take care of myself, without worrying about what others might think. I wear a goofy hat (my husband deemed it my “Minnie Pearl” hat) cooling towel, arm sleeves, extra water and electrolytes to ward off heat stroke in summer. I take pepper spray and sometimes a sheathed knife on a belt if I’m riding at night in an isolated area. "I listen to my body and instincts and take care of myself, without worrying what others might think. I wear a goofy hat, cooling towel, arm sleeves..."
How else has cycling been a tool for your freedom? Bicycling has opened up all kinds of new interests for me. I volunteer with a bicycle advocacy group, helping with bike swaps, bike-to-work days, etc. I’ve become a multi modal infrastructure nerd, studying urban street design and trying to influence public policy. My dream is to see the day when children can once again ride bicycles around town freely and safely, like I was able to do. For now, I hope people see me riding around with my gray hair and “Minnie Pearl” hat and think, If that old lady can do it, maybe I can too. Any exciting plans for the future, Susan? I remain very interested in long distance bike touring. I’m in the information-gathering/ waiting-for-my-elderly-dog-to-pass-on/ husband-to-retire-so-he-can-go-with-me, mode right now. Might these be subconscious excuses for not going right now, solo, because of some underlying fear? Olivia and her wonderful blog are making me think . 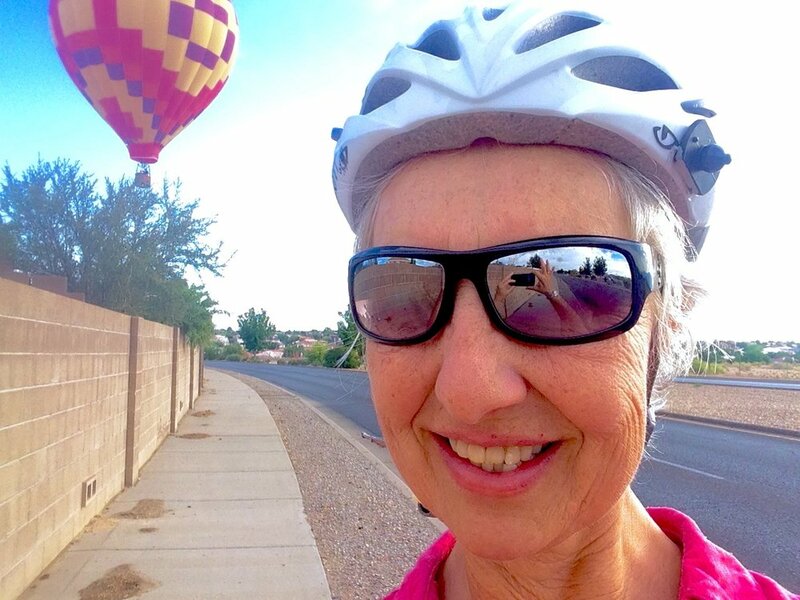 . .
"I hope people see me riding around with my gray hair and think, If that old lady can do it, maybe I can too." Inspired by this interview with Susan? Drop us a line below! Know an amazing Bicycle-Riding Female who should be featured on this site? Contact me! There’s plenty more cycling interviews to explore. Click here! And as always, thanks for reading and enjoy the ride.